1 3/8" Light Up Diamond Ring. 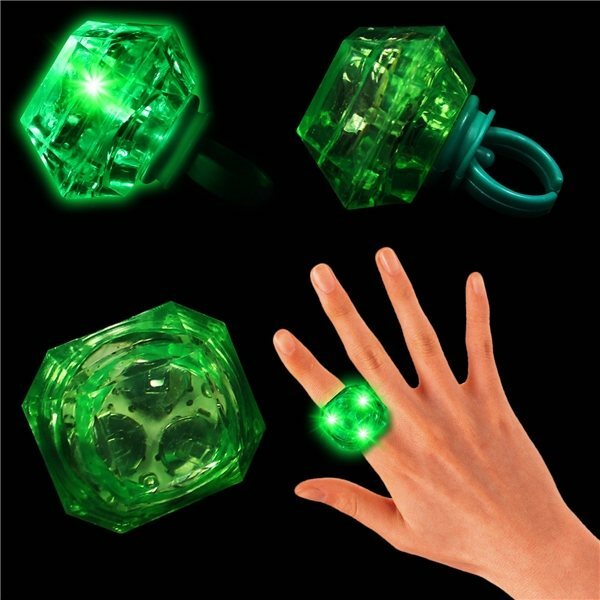 This fun novelty has a VERY IMPRESSIVE gemstone inspired imprint area and when turned on its High Powered L.E.D. 's creates a really visible Billboard of Imprinted Luminosity. Click the on/off button to choose from a slow flashing light setting, a fast flashing light setting and a steady on light setting. Batteries are included and installed, but NOT replaceable. The rings are priced by the individual piece. IMPORTANT: The ring size is designed for children's fingers or those of small adults. Not recommended for larger hands.